MainAll NewsInside IsraelWhy did Democratic congressmen meet with anti-Israel terrorist? Why did Democratic congressmen meet with anti-Israel terrorist? Five House Democrats met with PFLP terrorist during trip to Judea and Samaria. Five congressional Democrats met with an Arab terrorist affiliated with the Popular Front for the Liberation of Palestine, the organization responsible for the assassination of Tourism Minister Rehavam Zeevi and decades of murderous terror attacks on Israeli civilians and security forces. The five House Democrats, including Luis Gutierrez (Illinois), Hank Johnson (Georgia), Matt Cartwright (Pennsylvania), Dan Kildee (Michigan), and Mark Pocan (Wisconsin), toured Judea, Samaria, and eastern Jerusalem on a guided tour paid for by the American Global Institute. The AGI, which was founded by Sudanese-born Arab lobbyist Alsadig Omer Khalafalla, covered the expenses for the five congressmen – amounting to between $11,000 and $15,000 for each participant. During the trip, the five met with Shawan Jabarin, whom the itinerary described as the General Director of Al-Haq, for a discussion on “Palestinian political prisoners”. What the AGI itinerary failed to note, however, are Jabarin’s ties to terrorism. A member of the PFLP, Jabarin was convicted for his efforts to enlist support abroad for attacks on Israel. He was sentenced to two years in prison, but was released after nine months due to respiratory difficulties. While Jabarin has since denied any ties to the terror group after his release from prison, rebranding himself as a “human rights activist”, a 2007 ruling by the Supreme Court found that he has used his ties with alleged human rights groups to conceal his terrorist activities. Because of his activities on behalf of the PFLP, Israel placed a travel ban on Jabarin in 2006. None of the five congressmen responded to questions posed by The Weekly Standard regarding the meeting with Jabarin. The Standard noted that while 71 members of congress had been invited to participate in the tour, only five accepted. Jonathan Schanzer of the Foundation for Defense of Democracies slammed the legislators, saying their failure to properly scrutinize the itinerary was either gross carelessness – or tacit support for terrorism. "At best, this was poor vetting and poor decision making on the part of these members, who may not have fully understood who they were meeting with,” he told the Standard. “At worst, they were knowingly engaging with a virulently anti-Israel figure with disconcerting ties to a known terrorist organization." 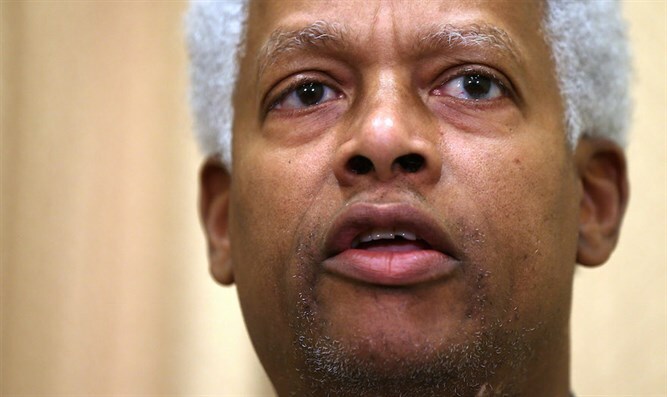 Two months after the trip, one of the participants, Hank Johnson, compared Jewish families living in Judea and Samaria to “termites”. “There has been a steady [stream], almost like termites can get into a residence and eat before you know that you’ve been eaten up and you fall in on yourself, there has been settlement activity that has marched forward with impunity and at an ever increasing rate to the point where it has become alarming,” Johnson said at an event organized by the US Campaign to End the Israeli Occupation.